Clap your hands, all you peoples; shout to God with loud songs of joy. For the Lord, the Most High, is awesome, a great king over all the earth. God has gone up with a shout, the Lord with the sound of a trumpet. Sing praises to God, sing praises; sing praises to our King, sing praises. For God is the king of all the earth; sing praises with a psalm. God is king over the nations; God sits on his holy throne. The princes of the peoples gather as the people of the God of Abraham. For the shields of the earth belong to God; he is highly exalted. How good it is to sing praises to our God; for he is gracious, and a song of praise is fitting. The Lord builds up Jerusalem; he gathers the outcasts of Israel. He heals the brokenhearted, and binds up their wounds. He determines the number of the stars; he gives to all of them their names. Great is our Lord, and abundant in power; his understanding is beyond measure. The Lord lifts up the downtrodden; he casts the wicked to the ground. Sing to the Lord with thanksgiving; make melody to our God on the lyre. He covers the heavens with clouds, prepares rain for the earth, makes grass grow on the hills. He gives to the animals their food, and to the young ravens when they cry. His delight is not in the strength of the horse, nor his pleasure in the speed of a runner; but the Lord takes pleasure in those who fear him, in those who hope in his steadfast love. Then he brought me back to the entrance of the temple; there, water was flowing from below the threshold of the temple toward the east (for the temple faced east); and the water was flowing down from below the south end of the threshold of the temple, south of the altar. Then he brought me out by way of the north gate, and led me around on the outside to the outer gate that faces toward the east;a and the water was coming out on the south side. Almighty God, who gave such grace to your apostle Saint Andrew that he readily obeyed the call of your Son Jesus Christ and brought his brother with him: call us by your holy word, and give us grace to follow you without delay and to tell the good news of your kingdom; through Jesus Christ your Son our Lord, who is alive and reigns with you, in the unity of the Holy Spirit, one God, now and for ever. Amen. 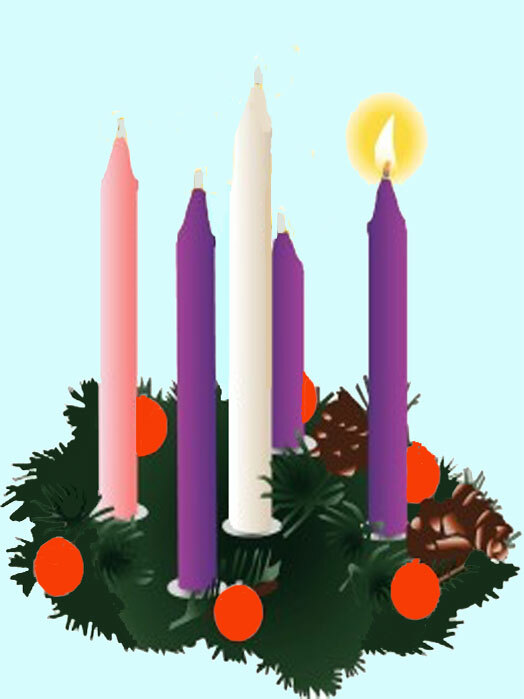 Today is Advent Sunday, the first day of the new liturgical year (being year 'C') and the beginning of the for week countdown to Christmas. The four weeks traditionally (within the Church of England) focus on the Patriarchs, the Prophets, John the Baptist and the Virgin Mary. Each Sunday in Advent we light a candle (purple for weeks 1, 2 & 4 and pink for week 3, which we call 'Gaudate' Sunday) and on Christmas Morning we light the central white candle. Some people have moved the themes of the Sundays to focus on Love, Joy, Peace and Hope - but I'll keep to the traditional stuff as I think it looks more at the Bible and less at the fluffy! The readings today point to the promise of a Saviour. Would you expect anything different considering the time of year it is? This is an opportunity for us to get our spiritual (and physical) houses in order as we prepare for Christmas day. On the physical front, many people will be thinking about Christmas day and the menus and the guest lists (and the the alcohol!) and will start tidying the house. They will be clearing their 'public' rooms, often by filling the private rooms with the clutter from elsewhere) so that they look presentable to their guests. Advent is a time when, spiritually, we do the complete opposite and set about clearing the private inner rooms in preparation for the coming of the baby Jesus. This is a time when we examine ourselves and throw out the things that make our spiritual lives untidy and unwelcoming. To do this we think about jesus' coming - corporately in the Advent courses which many church run and privately in our own prayer and study - and examine ourselves. And of course, fulfil it He does in the coming of Jesus, ' A righteous branch who will do what is 'just and right'. The problem is that as we enter the run in to Christmas (or as I like to call it 'Argostide') we can find ourselves far too taken up with gifts and menus and the like. We take for granted the conflicts and the natural disasters; the things that make us realise that where we are and the gimme in which we live is not running as God's plan might have it. This was exactly the same for those to whom Jeremiah spoke. And the answer is that as we celebrate the birth of Jesus some two thousand years ago we also look to His return as Messiah and King. Which fits in nicely (lucky or what?) with the Gospel and the 1 Thessalonians reading as they ask us some really important questions? Are we living in the expectation of the 'then' (Jesus' return) in the 'now'? Does love increase and overflow? Do you see the ways in which the world is pulling itself apart and gaming creation and those who live (near and far) on our planet? When was the last time you knew you were living a blameless and holy life? Some challenges I face as I prepare to celebrate jesus' coming to this earth as God made man; as a vulnerable and innocent child. Perhaps you'd like to take them up too? “How can we thank God enough for you in return for all the joy we have in the presence of our God because of you? Night and day we pray most earnestly that we may see you again and supply what is lacking in your faith. Now may our God and Father himself and our Lord Jesus clear the way for us to come to you. I will extol you, my God and King, and bless your name for ever and ever. Every day I will bless you, and praise your name for ever and ever. Great is the Lord, and greatly to be praised; his greatness is unsearchable. One generation shall laud your works to another, and shall declare your mighty acts. On the glorious splendour of your majesty, and on your wondrous works, I will meditate. The might of your awesome deeds shall be proclaimed, and I will declare your greatness. They shall celebrate the fame of your abundant goodness, and shall sing aloud of your righteousness. The Lord is gracious and merciful, slow to anger and abounding in steadfast love. The Lord is good to all, and his compassion is over all that he has made. All your works shall give thanks to you, O Lord, and all your faithful shall bless you. They shall speak of the glory of your kingdom, and tell of your power, to make known to all people your mighty deeds, and the glorious splendour of your kingdom. Your kingdom is an everlasting kingdom, and your dominion endures throughout all generations. The Lord is faithful in all his words, and gracious in all his deeds. The Lord upholds all who are falling, and raises up all who are bowed down. The eyes of all look to you, and you give them their food in due season. You open your hand, satisfying the desire of every living thing. The Lord is just in all his ways, and kind in all his doings. The Lord is near to all who call on him, to all who call on him in truth. He fulfils the desire of all who fear him; he also hears their cry, and saves them. The Lord watches over all who love him, but all the wicked he will destroy. My mouth will speak the praise of the Lord, and all flesh will bless his holy name for ever and ever. Now the Lord is about to lay waste the earth and make it desolate, and he will twist its surface and scatter its inhabitants. And it shall be, as with the people, so with the priest; as with the slave, so with his master; as with the maid, so with her mistress; as with the buyer, so with the seller; as with the lender, so with the borrower; as with the creditor, so with the debtor. The earth shall be utterly laid waste and utterly despoiled; for the Lord has spoken this word. The earth dries up and withers, the world languishes and withers; the heavens languish together with the earth. The earth lies polluted under its inhabitants; for they have transgressed laws, violated the statutes, broken the everlasting covenant. Therefore a curse devours the earth, and its inhabitants suffer for their guilt; therefore the inhabitants of the earth dwindled, and few people are left. The wine dries up, the vine languishes, all the merry-hearted sigh. The mirth of the timbrels is stilled, the noise of the jubilant has ceased, the mirth of the lyre is stilled. No longer do they drink wine with singing; strong drink is bitter to those who drink it. The city of chaos is broken down, every house is shut up so that no one can enter. There is an outcry in the streets for lack of wine; all joy has reached its eventide; the gladness of the earth is banished. Desolation is left in the city, the gates are battered into ruins. For thus it shall be on the earth and among the nations, as when an olive tree is beaten, as at the gleaning when the grape harvest is ended. They lift up their voices, they sing for joy; they shout from the west over the majesty of the Lord. Therefore in the east give glory to the Lord; in the coastlands of the sea glorify the name of the Lord, the God of Israel. From the ends of the earth we hear songs of praise, of glory to the Righteous One. But I say, I pine away, I pine away. Woe is me! For the treacherous deal treacherously, the treacherous deal very treacherously. Terror, and the pit, and the snare are upon you, O inhabitant of the earth! for the Lord of hosts will reign on Mount Zion and in Jerusalem, and before his elders he will manifest his glory. Then he began to reproach the cities in which most of his deeds of power had been done, because they did not repent. “Woe to you, Chorazin! Woe to you, Bethsaida! For if the deeds of power done in you had been done in Tyre and Sidon, they would have repented long ago in sackcloth and ashes. But I tell you, on the day of judgment it will be more tolerable for Tyre and Sidon than for you. And you, Capernaum, will you be exalted to heaven? 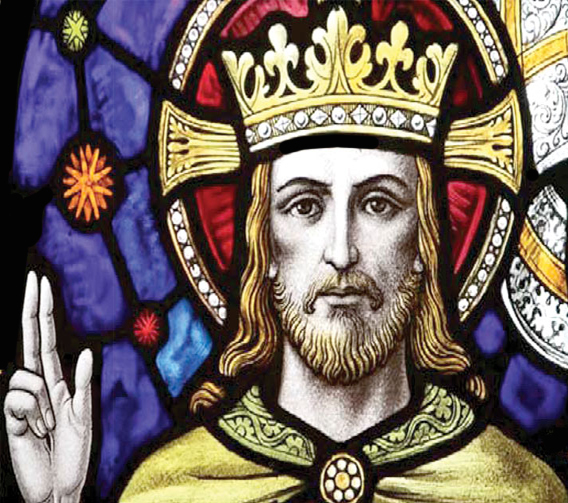 God the Father, help us to hear the call of Christ the King and to follow in his service, whose kingdom has no end; for he reigns with you and the Holy Spirit, one God, one glory. Amen. If I climb up to heaven, you are there; if I make the grave my bed, you are there also. If I take the wings of the morning and dwell in the uttermost parts of the sea, Even there your hand shall lead me, your right hand hold me fast. Even darkness is no darkness with you, the night is as clear as the day; darkness and light to you are both alike. For you yourself created my inmost parts; you knit me together in my mother’s womb. I thank you, for I am fearfully and wonderfully made; marvellous are your works, my soul knows well. My frame was not hidden from you, when I was made in secret and woven in the depths of the earth. Your eyes beheld my form, as yet unfinished; already in your book were all my members written, As day by day they were fashioned when as yet there was none of them. How deep are your counsels to me, O God! If I count them, they are more in number than the sand, and at the end, I am still in your presence. O that you would slay the wicked, O God, that the bloodthirsty might depart from me! Search me out, O God, and know my heart; try me and examine my thoughts. See if there is any way of wickedness in me and lead me in the way everlasting. The oracle concerning the valley of vision. What do you mean that you have gone up, all of you, to the housetops, you that are full of shoutings, tumultuous city, exultant town? Your slain are not slain by the sword, nor are they dead in battle. Your rulers have all fled together;Cthey were captured without the use of a bow. All of you who were found were captured, though they had fled far away. Therefore I said: Look away from me, let me weep bitter tears; do not try to comfort me for the destruction of my beloved people. For the Lord God of hosts has a day of tumult and trampling and confusion in the valley of vision, a battering down of walls and a cry for help to the mountains. Elam bore the quiver with chariots and cavalry, and Kir uncovered the shield. Your choicest valleys were full of chariots, and the cavalry took their stand at the gates. He has taken away the covering of Judah. On that day you looked to the weapons of the House of the Forest, and you saw that there were many breaches in the city of David, and you collected the waters of the lower pool. You counted the houses of Jerusalem, and you broke down the houses to fortify the wall. You made a reservoir between the two walls for the water of the old pool. But you did not look to him who did it, or have regard for him who planned it long ago. The Lord of hosts has revealed himself in my ears: Surely this iniquity will not be forgiven you until you die, says the Lord God of hosts. Unless the Lord builds the house, those who build it labour in vain. Unless the Lord keeps the city, the guard keeps watch in vain. It is in vain that you hasten to rise up early and go so late to rest, eating the bread of toil, for he gives his beloved sleep. Children are a heritage from the Lord and the fruit of the womb is his gift. Like arrows in the hand of a warrior, so are the children of one’s youth. Happy are those who have their quiver full of them: they shall not be put to shame when they dispute with their enemies in the gate. As whirlwinds in the Negeb sweep on, it comes from the desert, from a terrible land. A stern vision is told to me; the betrayer betrays, and the destroyer destroys. Go up, O Elam, lay siege, O Media; all the sighing she has caused I bring to an end. Therefore my loins are filled with anguish; pangs have seized me, like the pangs of a woman in labour; I am bowed down so that I cannot hear, I am dismayed so that I cannot see. My mind reels, horror has appalled me; the twilight I longed for has been turned for me into trembling. They prepare the table, they spread the rugs, they eat, they drink. Rise up, commanders, oil the shield! One is calling to me from Seir, ‘Sentinel, what of the night? Refrain: The Lord is king and has put on glorious apparel. See, the Lord is riding on a swift cloud and comes to Egypt; the idols of Egypt will tremble at his presence, and the heart of the Egyptians will melt within them. I will stir up Egyptians against Egyptians, and they will fight, one against the other, neighbour against neighbour, city against city, kingdom against kingdom; the spirit of the Egyptians within them will be emptied out, and I will confound their plans; they will consult the idols and the spirits of the dead and the ghosts and the familiar spirits; I will deliver the Egyptians into the hand of a hard master; a fierce king will rule over them, says the Sovereign, the Lord of hosts. The waters of the Nile will be dried up, and the river will be parched and dry; its canals will become foul, and the branches of Egypt’s Nile will diminish and dry up; reeds and rushes will rot away. There will be bare places by the Nile, on the brink of the Nile; and all that is sown by the Nile will dry up, be driven away, and be no more. Those who fish will mourn; all who cast hooks in the Nile will lament, and those who spread nets on the water will languish. The workers in flax will be in despair, and the carders and those at the loom will grow pale. Its weavers will be dismayed, and all who work for wages will be grieved. The princes of Zoan are utterly foolish; the wise counsellors of Pharaoh give stupid counsel. How can you say to Pharaoh, ‘I am one of the sages, a descendant of ancient kings’? Where now are your sages? Let them tell you and make known what the Lord of hosts has planned against Egypt. The princes of Zoan have become fools, and the princes of Memphis are deluded; those who are the cornerstones of its tribes have led Egypt astray. The Lord has poured into them a spirit of confusion; and they have made Egypt stagger in all its doings as a drunkard staggers around in vomit. Neither head nor tail, palm branch nor reed, will be able to do anything for Egypt. On that day the Egyptians will be like women, and tremble with fear before the hand that the Lord of hosts raises against them. And the land of Judah will become a terror to the Egyptians; everyone to whom it is mentioned will fear because of the plan that the Lord of hosts is planning against them. On that day there will be an altar to the Lord in the centre of the land of Egypt, and a pillar to the Lord at its border. It will be a sign and a witness to the Lord of hosts in the land of Egypt; when they cry to the Lord because of oppressors, he will send them a saviour, and will defend and deliver them. The Lord will make himself known to the Egyptians; and the Egyptians will know the Lord on that day, and will worship with sacrifice and burnt-offering, and they will make vows to the Lord and perform them. The Lord will strike Egypt, striking and healing; they will return to the Lord, and he will listen to their supplications and heal them. Recently I visited a parish on the very edge of a city centre and was treated to a tour of the features and facilities within its boundaries. We started at a splendid church hall with many rooms and a variety of posters and notices advertising Bridge and Canasta and the like. From there we went on to see the parish itself, row upon row of fine Edwardian and Victorian mansions boasting marvellous front lawns and palatial entrances. As my host drove me round pointing out the homes of the notable residents, the celebrities and the ennobled I found myself reflecting upon how different it was from the estate church setting I work and reside in. My thoughts were then interrupted as my host pointed out a junction and pointedly explained how we had reached the boundary. 'That side of the road,' they said, 'is social housing. We don't have anything to do with them!" Point made, we drove on, more names bandied about as being residents, until we came to another junction and again we stopped and I was informed that this was another boundary. 'That road,' they said, pointing at what looked no different to the rest through my uneducated eyes, 'Used to be a lovely road, but now it's full of (voice dropping a little) of Asians!' The rest of the journey was much of the same, I was shown where the 'difficult parish' abutted their little piece of heaven and told stories of the great and good who were members of the paradise on earth that was theirs. Thankful that I hadn't choked on the canapés or caught anything mission threatening from those gathered in the place I mentioned social audits and the value of the palace that was their church hall (five rooms plus a kitchen and toilets almost as large as the building our church occupies!) was in attracting people and building relationships and left. "so there we were, huddled in the back of a rather large saloon car being driven by the parish rector is surrounded by other members of his parish staff. The Rector was very keen to impress, and in many ways he had reason to be proud of his team's achievements. The parish church was extraordinarily large, and he proudly boasted that they nearly filled it with willing members every Sunday. So, having found a kindred spirit in the first few pages, would the restt of the book live up to expectations? I found the book to be a wealth of theological reflection, which considering his now seminal work 'Let's do theology' (which appears in the hands of many training for ministry) should come as no surprise I guess. But add to this the insights of a man who has dedicated his ministry to working in the poorer places and ministering the love of God to those on the edges and thinking about it with the Bible aforethought and you soon realise that this is a bit of an understated gem. 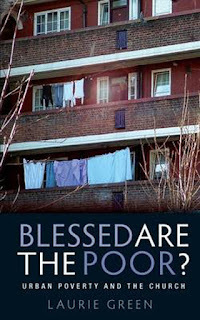 This is a book in which missional thinking, good honest ministry, the Bible and theology all collide as Laurie leads us into thinking about what this part of the beatitudes ('blessed are the poor') really means in a world where they only seem to inherit being marginalised, vilified and ignored. This is an invitation for us to explore just how counter-cultural we are called to be - and it is most certainly something I would love to send to the PCC of the church I make mention of at the beginning of this blog. As someone blessed with living and working in an Urban priority area / Estate church I know the generosity and love, the enthusiasm for the Gospel lived out in a place where the minority are waged and everyday life is difficult. I also know that many around me in the wider community have definite views about social housing and those who have little. Those who have would like more and those who have little deserve all they get (but not my taxpayer's cash in benefits). The Rake's progress that was post-war social housing and it's demise with the 'Right to Buy' and the rise of the private sector landlords (and now housing associations who are providing a halfway house between state and private social housing) brings much fruit and many attitudes - not all of which are positive when it comes to the attitudes of the people formerly known as 'working class' towards the poor; for the poor have indeed become poorer, even amongst their own it seems. 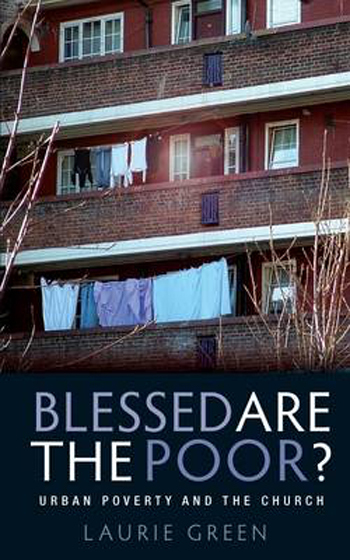 This is no purely academic book on the poor and poverty (although the academic is present and appears correct) and it is not a quick read (200 pages requires some commitment); but it is an essential read for those looking to minister on the edges of our society. I have to say that, like most books with a 'theology' label, this is a book that doesn't come cheap with a price tag of £18.99 on Amazon (but under a tenner used) (AMAZON) but if you are serious about estate church and 'the poor' - which always sounds to me to be on a par with those who used to call out, 'Oh workman,' when I was a BT engineer as something just a little derogatory - then this is a book that demands shelf space. The Lord is king: let the earth rejoice; let the multitude of the isles be glad. Clouds and darkness are round about him; righteousness and justice are the foundation of his throne. His lightnings lit up the world; the earth saw it and trembled. The mountains melted like wax at the presence of the Lord, at the presence of the Lord of the whole earth. Confounded be all who worship carved images and delight in mere idols. Bow down before him, all you gods. Zion heard and was glad, and the daughters of Judah rejoiced, because of your judgements, O Lord. For you, Lord, are most high over all the earth; you are exalted far above all gods. The Lord loves those who hate evil; he preserves the lives of his faithfuand delivers them from the hand of the wicked. The Lord has made known his salvation; his deliverance has he openly shown in the sight of the nations. He has remembered his mercy and faithfulness towards the house of Israel, and all the ends of the earth have seen the salvation of our God. Sound praises to the Lord, all the earth; break into singing and make music. Make music to the Lord with the lyre, with the lyre and the voice of melody. With trumpets and the sound of the horn sound praises before the Lord, the King. Let the rivers clap their hands and let the hills ring out together before the Lord, for he comes to judge the earth. In righteousness shall he judge the world and the peoples with equity. See, Damascus will cease to be a city, and will become a heap of ruins. Her towns will be deserted for ever; they will be places for flocks, which will lie down, and no one will make them afraid. The fortress will disappear from Ephraim, and the kingdom from Damascus; and the remnant of Aram will be like the glory of the children of Israel, says the Lord of hosts. On that day the glory of Jacob will be brought low, and the fat of his flesh will grow lean. And it shall be as when reapers gather standing grain and their arms harvest the ears, and as when one gleans the ears of grain in the Valley of Rephaim. Gleanings will be left in it, as when an olive tree is beaten - two or three berries in the top of the highest bough, four or five on the branches of a fruit tree, says the Lord God of Israel. On that day people will regard their Maker, and their eyes will look to the Holy One of Israel; they will not have regard for the altars, the work of their hands, and they will not look to what their own fingers have made, either the sacred poles or the altars of incense. On that day their strong cities will be like the deserted places of the Hivites and the Amorites, which they deserted because of the children of Israel, and there will be desolation. For you have forgotten the God of your salvation, and have not remembered the Rock of your refuge; therefore, though you plant pleasant plants and set out slips of an alien god, though you make them grow on the day that you plant them, and make them blossom in the morning that you sow; yet the harvest will flee away on a day of grief and incurable pain. Ah, the thunder of many peoples, they thunder like the thundering of the sea! Ah, the roar of nations, they roar like the roaring of mighty waters! The nations roar like the roaring of many waters, but he will rebuke them, and they will flee far away, chased like chaff on the mountains before the wind and whirling dust before the storm. At evening time, lo, terror! Before morning, they are no more. This is the fate of those who despoil us, and the lot of those who plunder us. Then Jesus summoned his twelve disciples and gave them authority over unclean spirits, to cast them out, and to cure every disease and every sickness. These are the names of the twelve apostles: first, Simon, also known as Peter, and his brother Andrew; James son of Zebedee, and his brother John; Philip and Bartholomew; Thomas and Matthew the tax-collector; James son of Alphaeus, and Thaddaeus; Simon the Cananaean, and Judas Iscariot, the one who betrayed him. These twelve Jesus sent out with the following instructions: ‘Go nowhere among the Gentiles, and enter no town of the Samaritans, but go rather to the lost sheep of the house of Israel. As you go, proclaim the good news, “The kingdom of heaven has come near.” Cure the sick, raise the dead, cleanse the lepers, cast out demons. You received without payment; give without payment. Take no gold, or silver, or copper in your belts, no bag for your journey, or two tunics, or sandals, or a staff; for labourers deserve their food. Whatever town or village you enter, find out who in it is worthy, and stay there until you leave. As you enter the house, greet it. If the house is worthy, let your peace come upon it; but if it is not worthy, let your peace return to you. If anyone will not welcome you or listen to your words, shake off the dust from your feet as you leave that house or town. Truly I tell you, it will be more tolerable for the land of Sodom and Gomorrah on the day of judgement than for that town. that they, plenteously bringing forth the fruit of good works, may by you be plenteously rewarded; through Jesus Christ our Lord. Amen. It is a good thing to give thanks to the Lord and to sing praises to your name, O Most High; To tell of your love early in the morning and of your faithfulness in the night-time, Upon the ten-stringed instrument, upon the harp, and to the melody of the lyre. For you, Lord, have made me glad by your acts, and I sing aloud at the works of your hands. O Lord, how glorious are your works! The senseless do not know, nor do fools understand, That though the wicked sprout like grass and all the workers of iniquity flourish, It is only to be destroyed for ever; but you, O Lord, shall be exalted for evermore. For lo, your enemies, O Lord, lo, your enemies shall perish, and all the workers of iniquity shall be scattered. But my horn you have exalted like the horns of wild oxen; I am anointed with fresh oil. My eyes will look down on my foes; my ears shall hear the ruin of the evildoers who rise up against me. The righteous shall flourish like a palm tree, and shall spread abroad like a cedar of Lebanon. Such as are planted in the house of the Lord shall flourish in the courts of our God. They shall still bear fruit in old age; they shall be vigorous and in full leaf; That they may show that the Lord is true; he is my rock, and there is no unrighteousness in him. Sing to the Lord a new song; sing to the Lord, all the earth. Sing to the Lord and bless his name; tell out his salvation from day to day. Declare his glory among the nations and his wonders among all peoples. For great is the Lord and greatly to be praised; he is more to be feared than all gods. For all the gods of the nations are but idols; it is the Lord who made the heavens. Honour and majesty are before him; power and splendour are in his sanctuary. Ascribe to the Lord, you families of the peoples; ascribe to the Lord honour and strength. Ascribe to the Lord the honour due to his name; bring offerings and come into his courts. O worship the Lord in the beauty of holiness; let the whole earth tremble before him. Tell it out among the nations that the Lord is king. He has made the world so firm that it cannot be moved; he will judge the peoples with equity. Let the fields be joyful and all that is in them; let all the trees of the wood shout for joy before the Lord. For he comes, he comes to judge the earth; with righteousness he will judge the world and the peoples with his truth. How the oppressor has ceased! How his insolence has ceased! Your pomp is brought down to Sheol, and the sound of your harps; maggots are the bed beneath you, and worms are your covering. All the kings of the nations lie in glory, each in his own tomb; but you are cast out, away from your grave, like loathsome carrion, clothed with the dead, those pierced by the sword, who go down to the stones of the Pit, like a corpse trampled underfoot. You will not be joined with them in burial, because you have destroyed your land, you have killed your people. May the descendants of evildoer nevermore be named! While he was saying these things to them, suddenly a leader of the synagogue came in and knelt before him, saying, ‘My daughter has just died; but come and lay your hand on her, and she will live.’ And Jesus got up and followed him, with his disciples. Then suddenly a woman who had been suffering from haemorrhages for twelve years came up behind him and touched the fringe of his cloak, for she said to herself, ‘If I only touch his cloak, I will be made well.’ Jesus turned, and seeing her he said, ‘Take heart, daughter; your faith has made you well.’ And instantly the woman was made well. When Jesus came to the leader’s house and saw the flute-players and the crowd making a commotion, he said, ‘Go away; for the girl is not dead but sleeping.’ And they laughed at him. But when the crowd had been put outside, he went in and took her by the hand, and the girl got up. And the report of this spread throughout that district. As Jesus went on from there, two blind men followed him, crying loudly, ‘Have mercy on us, Son of David!’ When he entered the house, the blind men came to him; and Jesus said to them, ‘Do you believe that I am able to do this?’ They said to him, ‘Yes, Lord.’ Then he touched their eyes and said, ‘According to your faith let it be done to you.’ And their eyes were opened. Then Jesus sternly ordered them, ‘See that no one knows of this.’ But they went away and spread the news about him throughout that district. The Christian year, liturgically speaking, begins with Advent Sunday and has its last Sunday (today) with Christ the King - and this, like every year, has been immense. Advent sees us preparing for the birth of Jesus and this is where our year gets started as we find ourselves with shepherds, magi, baptism, miracles, transfiguration, triumphal entry, betrayal, beating and finally death… And then resurrection: Rebirth, appearing, ascending, Spirit descending - living in the power of the risen Christ: And then repeat again! The purple of Advent gives way to the white and gold of Christmas just as it does at Lent: two preparations: the first for a baby, the second for a resurrected Christ. Jesus, a King whose kingdom is not of this world coming in to a world of a cruel and wicked puppet King, and frightening him when he hears that the ‘King of kings is coming to his patch’! Joy to the world! Yeah, if it's not your child going to be killed as Herod tries to eradicate the threat that this newborn King apparently is – after all, he’s killed his own kids to stave off any threat to his throne, what's the kids of others matter? Preparation for the job ahead sees Jesus in the wilderness: how have we done in the comfort and plenty of where we find ourselves I wonder? What have, and how have we, experienced in our wilderness moments? How have we handled the job in hand? Jesus comes as a servant into a place where the King lived to be served. He with all authority and power was vanished away to another country as a refugee – escaping death at the hands of a despotic leader. I wonder if He and His family were welcomed. Did the powers that be in Egypt have a debate and vote to not allow refugees into their land like the Americans just have? Here we are at another Christ the King, but so what? One of the joys of being part of a church that is grounded in the word and focuses on the calendar is that we mark many important moments in our feasts and festivals and lectionary readings, but to what end? Do they challenge, inspire and change us, or are they as hollow as Christmas is for some when they have reached the age where it means socks, underpants and slippers? Have we lost the joy of our first love and allowed our zeal to become mere habit? Every Sunday we pray, “Your Kingdom come…” And yet, as Justin Welby himself has said regarding the Paris murders, “I ask where God is and I have my own personal doubt over it.” We pray it, but when do we see it, hear of others experiencing it, experience it for ourselves? And of that passing doubt; it needs to be treasured for it is in doubt that our faith is made real. I thank God for a man at the helm who shares the same highs and lows, trials and tests as me (though many will I am sure vilify and criticise him for his honesty). This leads us to a junction where we can continue towards the cross, praying, reading, trusting, serving others and worshipping God in word, music, prayer and life. We can decide that we need to take things into our own hands and so we campaign, we act in our own strong that bringing into being those things that we consider to be ‘best’ with little thought to what the Christ calls us to look and live like. Assuming that our God is impotent and unable (or worse still: Unwilling) to act, decide to embark upon a popularity contest and rewrite the Bible and recreate God to make her popular and where there were commandments establish suggestions which possess nothing of the essential about them. ‘To Him was given dominion and glory and kingship, that all peoples, nations, and languages should serve him. His dominion is an everlasting dominion that shall not pass away, and his kingship is one that shall never be destroyed. Do we believe this to be true? Look! He is coming with the clouds, every eye will see him, even those who pierced him; and on his account all the tribes of the earth will wail. So it is to be. Amen. I am the Alpha and the Omega’, says the Lord God, who is and who was and who is to come, the Almighty. Are we expectantly looking to the East and the dawn that heralds the coming of Jesus, the Christ, the Almighty? Are we listening to the authentic voice of Jesus in our lives, the lives of those around us and for our nation? his clothing was white as snow, and the hair of his head like pure wool; his throne was fiery flames; its wheels were burning fire. A stream of fire issued and came out from before him; a thousand thousands served him, and ten thousand times ten thousand stood before him; the court sat in judgement, and the books were opened. “I saw in the night visions, and behold, with the clouds of heaven there came one like a son of man, and he came to the Ancient of Days and was presented before him. And to him was given dominion and glory and a kingdom, that all peoples, nations, and languages should serve him; his dominion is an everlasting dominion, which shall not pass away, and his kingdom one that shall not be destroyed. Grace to you and peace from him who is and who was and who is to come, and from the seven spirits who are before his throne, and from Jesus Christ the faithful witness, the firstborn of the dead, and the ruler of kings on earth. To him who loves us and has freed us from our sins by his blood and made us a kingdom, priests to his God and Father, to him be glory and dominion forever and ever. Amen. Behold, he is coming with the clouds, and every eye will see him, even those who pierced him, and all tribes of the earth will wail on account of him. Even so. Amen. When we wil we mean 'Never Again'? So tell me more about this Christian stuff? So What's being a Christian all about then?